Baked Nutella S’mores - All the wonderful flavors of s'mores without an open fire! Dark chocolate, graham crackers, marshmallows & Nutella. 1. Preheat the oven to 350 degrees. Spray a 9x13 baking pan with Pam cooking spray. 2. Crush the graham crackers in the food processor or in a large resealable bag using a rolling pin. Stir together the melted butter, salt, and graham cracker crumbs. 3. Press the mixture into the bottom of the baking dish until the crumbs come up around the sides of the pan about one inch. ( Use the bottom of a measuring cup to help press and make it uniform.) Bake the crust for 7 minutes at 350 degrees. 4. While the crust is baking, heat the heavy cream up in a sauce pan on the stove. Place all the chocolate chips in a large bowl. When the heavy cream simmers, pour over the chocolate chips and stir until the chocolate is completely melted. 5. Stir the Nutella spread into the melted chocolate until completely combined. Gently pour the mixture into the warm graham cracker crust, and cautiously spread the chocolate evenly. 6. Cut 15 regular size marshmallows in half and place randomly all over the chocolate mixture, cut side down. 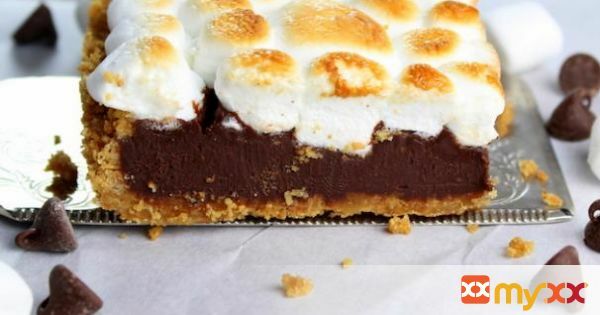 Fill in the rest of the pan with mini marshmallows until the chocolate layer is completely covered. 7. Turn the oven on high broil, place the baking pan on the middle rack of the oven, and broil for 30-45 seconds or until marshmallows are puffed up and golden in color. 8. Chill in the fridge for 1-2 hours or until the chocolate layer is no longer soft.